Only showing entries about tuscan hills from Backpacking Europe on fifty dollars/day. View entries about tuscan hills from all Travellerspoint blogs. We were up early November 13, left Selcuk, Turkey by private car, as planned at 530 and arrived at Izmir airport at 630 am. Flew Pegasus Air, changed planes in Istanbul and arrived at BLQ in Bologna Italy about 230 pm, the time changed, we gained an hour. Our flight cost something like one hundred and twenty two dollars Canadian each from Izmir Turkey to Bologna. We took a bus to the central station in Bologna, about six E. each and then took a cab to our hotel for eight E. Our room is clean and quaint, it has a great balcony, lots of nice white towels, we like it here. 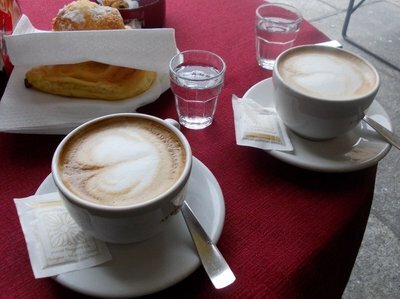 We bought a coffee in the pretty lobby, great, strong, fairly good size, we love Italy. We took a walk, picked up some Euros, got some bread, salami and olive paste, I got three tetra packs of wine (like little juice packs, I am not a wine connoisseur obviously) and we had a picnic on our balcony as we had not really eaten all day and the nearby restaurants do not open til seven pm. We have not used Euros since Estonia. Nine countries, nine currencies, even though most of them (Latvia, Lithuania, Poland, Bulgaria and Romania) are in the EU. For the next three weeks we will only need Euros..
At 730 we walked to the Trattoria, stepped in, all white tablecloths, mirrors and gorgeous light fixtures. Quick as a wink the staff were wrestling me out of my coat, which consists of a black nylon hooded rain jacket over a blue fleece jacket, really awkward getting the two off at once. Anyway, we are not exactly fashion plates but we brazened it out and tried not to gasp when the menu was presented. Two water and a toothpick please. By this time a basket of assorted bread and rolls had arrived along with a glass carafe of carbonated water. 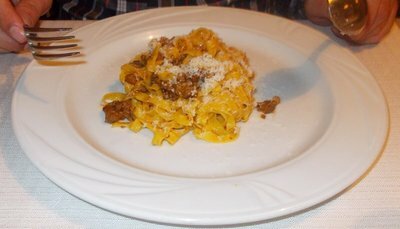 After eye contact gestures we decide to have pasta bolognese, the first course, and skip the main. A fairly skimpy bowl of pasta arrived and we ate slowly and chewed carefully. This was one of the smallest meals of our trip and hopefully the most expensive. But an experience all the same. Before bringing the pasta they brought us each a little polenta wedge with something on top, and when they took away the empty pasta dishes they brought little tarts. We each ordered dessert, Jeff had gelato and I had creme brulee and the bill was fifty euro which is our combined food budget for a day and a half. Consequently, we will be having more picnics. It was funny when we left, the lady server was holding my blue fleece, the gentleman had my limp black rain jacket and eventually they got me bundled back up and on my way. We loved our 35 euro a night hotel room, Arcoveggio Hotel, so much we wanted to stay an extra day but they were booked solid so we took a city bus to the train station, and bought train tickets to Florence for just thirty euro for two tickets on a high speed train, some kind of good discount. The train was leaving at four pm, so being too cheap to pay five euros each to check our packs we walked to the centre of Bologna, pretty city, blocks of shops, nice square. Along the way we passed through miles of covered arcades in the central shopping district, nicely protecting us from the weather. Bologna is the culinary capital of Italy apparently. It also has the oldest University in the WORLD, dates back to 1088. The train was very comfortable, most of the trip was in a tunnel, with very brief flashes of green countryside and small mountains, we talked with Tanya, a lovely girl from Rome who spoke good English, she had lived in Miami for a year, also England, and had worked on a cruise ship. She told us to go to San Gimignano.... instead of Siena, she knew we would like it better and she was right. Because we talked about the good Italian coffee after all that tea in Turkey she gave us each a lovely coffee chocolate. Nice girl. Rolling hills, green with shots of gold, it seems to be early autumn in Tuscany. The roses and pots of geraniums are still blooming. Can there be anything more beautiful than the countryside around Florence in mid November? Grape vines, olive trees, umbrella pines. Quaint villages perched on hills. For about fifteen dollars each we took a day trip to San Gimignano, but that will come later as it happened on 16 November. We arrived in Florence, the Renaissance capital of the world, on 14 November. We stayed at the Gennessio Hotel, walking distance from the train station, up a few flights of stairs, for three nights. 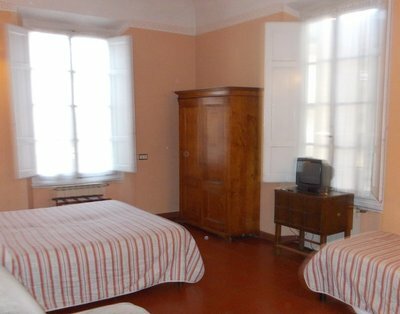 We had originally planned to stay one night and go to Sienna but after we had settled into our room and discovered it was clean and had a nice breakfast room decided to stay an extra night. The second night we moved to a larger nicer room with two windows and a lovely view, clean, good sheets and pillows, so at a little over fifty canadian a night we decided to stay three nights. Breakfast was included and we could get some English on the tv. These tvs are so small I can barely see them. I am lucky with my dim vision that I am taking in as many sites as I have been, without Jeff I would be wandering around in a haze. Yes, I am wearing glasses, they just cannot correct me enough to see twenty twenty, I am lucky I can see the walk signs let alone the street signs. So we picked up bread, olives paste, salami, antipasto and chocolate bars and had our supper in our room. 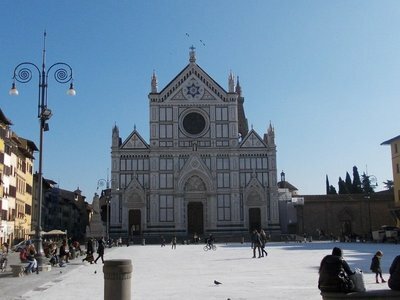 15 November, beautiful sunny day but with all the shade in Florence it was still a bit chilly. The streets are narrow, the buildings tall and it is absolutely picturesque. We walked down to the square near the railway station and hooked up with the free walking tour at 1030 am. The guide did not speak as clear English as some we have had so I was straining at times to understand, heavy on the architectural details. Because of this tour we went to St Croce square where some very famous people are buried inside the church. Being buried inside a church is a better guarantee of getting to heaven or so it seemed back then. Some really big guns are buried here so we paid the six euro admission and photographed the final resting spots of Galileo, Michaelangelo, Machiavelli and Marconi. We sat awhile in the sunny courtyard of the church, it was so quiet, peaceful and warm. Other tourists were there writing in their journals and eating their little picnics but it was very quiet and nice. Both gelato and sorbet were invented in Florence. Also little wooden pinnochio ornaments are everywhere. We stopped for panini for lunch at a small bar type establishment, and then continued on our way. Panini makes a nice, filling and inexpensive meal. We walked down by the river, and looked at the many bridges and then bought tickets to the world famous Uffizi museum I think 12.50 euros. There are rooms and rooms of paintings, I lost Jeff and spent an hour looking for him, he finally found me. Also numerous sculptures, we were there almost two hours and then trundled back to the hotel where we had another picnic supper, the bread crust is so hard you can hardly break it open and just shatters. but it is good bread, although I think Turkey had awesome bread and similar in taste to good homemade bread in Canada. Now for some reason I thought Michaelangelos David was in the Uffizi, we looked and looked and finally asked somebody only to find out that no, David is at the Accademia where we did not go. Time and money are both factors but also sore feet and burn out are another. We saw so many marble statues of naked men, some of their feet were so detailed you could see the veins and their toes and toe nails were really life-like. I did not examine the rest of these figures in such detail, but am sure they were painstakingly carved into the marble. 16 November was a gorgeous sunny day. We took the bus from Florence to San Gimignano in the Tuscan hills. The round trip was thirteen euro each. We had to change buses in Poggilbonsi, but the wait inbetween was not too long. The entire trip took about two hours getting there and just over an hour and a half to get back. The countryside is breathtaking really. Very green, lush rolling hills, vineyards, olive groves, trees, villas, villages, fields, gorgeous, with the mountains in the distance. 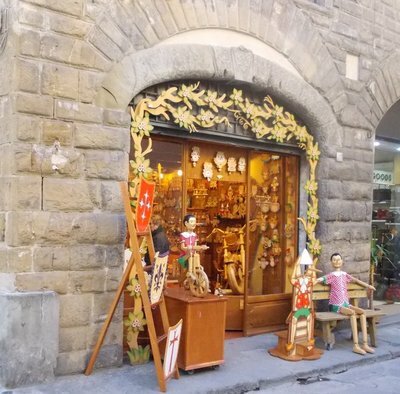 San Gimignano is a medieval town, with narrow streets, sweeping vistas of the Tuscany hills, charming and quaint, totally picturesque and easy to walk around. I still think Tallin Estonia has an awesome fairy tale old town but San Gimignano is a contender. The buildings are high, many towers, shop after shop of leather, souvenirs, purses, shoes, pottery, bakeries, candy. Yes, this would be a good place to stay over night and soak up the Tuscan sun. We enjoyed our day trip immensely. We had a coffee and sweets and panini in a bakery/restaurant, really good apple cake. The coffee here is fabulous, served with a little chocolate. The staff were friendly, boisterous even. We spent several hours in possibly the most charming village in the world, San Gimignano an easy day trip from either Florence or Siena and a good place to spend a few days for some down time. If you want to see a Medieval town in Tuscany this is the place! Located about 56 km south of Florence, or roughly halfway between Florence and Sienna the town of San Gimignano is built on a hillside overlooking lush valleys. In the third century BC it was the sight of an Etruscan village. A wall was constructed in the seventh Century and it still has fourteen tower houses built in feudal times by wealthy residents. It is a Unesco World Heritage Sight. Our bus trip back was kind of stressful. When we got off the bus outside the old walled city the driver waved his hand to indicate the spot where we would catch the bus home. We had a schedule and waited, some other people were there too and finally a bus came along with the town name, Poggilbonsi, written on it. It looked like a school bus and was filled with junior high maybe high school kids. Every body got on so we hopped on too and then looked at each other, my god this cannot be the right bus, but we were careening towards the town. When we got there we got off at a stop with some kids and wandered around looking for the bus station where we had made our morning transfer. As it turns out we found it fifteen minutes later and some of the same people who had been on the school bus with us were also waiting for the bus back to Florence, so I guess it was the right bus after all and and we got in an extra walk unnecessarilly. Anyway we made it back to Florence safe and sound on the top deck of a double decker bus, sweeping views of the Tuscan hills, greener than green, with little shots of gold as a few trees are changing colour. When we got back to Florence we booked our rail tickets to Rome for seventeen November. There was no discount and we could have shopped around but having stood in line for half an hour to find out tickets would be forty three euro each I just bit the bullet and bought them. Then we walked back to the hotel, stopping to have a bowl of tortellini on the way, five euros each and I had a half glass of fairly good red wine to wash that down for two euros. The parmesan cheese is really good, it isnt that kind that comes out of a box. You know in North America how the waiter comes around with the big pepper grinder and asks if you would like some fresh ground pepper and then grinds it over your food like he is really adding something special to your dish, ridiculous when you think about it. They do that in Italy with parmesan cheese and it really is a big deal and good. Florence really is a must see in Italy. We love it. And imagine if you were into art history and architecture it would be totally worth it to come here. We could have stayed a week but we have to get to Rome and see the sights there too and with only four full days in Rome it will be tight. The weather has been sunny, there are numerous outdoor cafes but we only like the ones in the sunshine as it is chilly in the shade. Locals drink their coffee standing up by a bar or stand up table, being tourists, and Canadians, we prefer to sit down and take it easy while we sip our cappucinos and espressos. 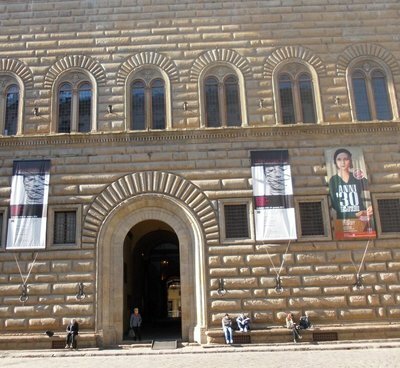 The rich people of course like the Medicis lived in huge complexes likely built around a central square where they may have done business as although the Medicis were bankers they engaged in other business endeavors as well. So the central courtyard would be used to sell their wares. The business would be on the first floor, the family would basically live on the second floor and the servants would live on the third floor. Now on the exterior of the buildings the rich owners were required to provide some street light for safety, less fighting among the rabble. They were also required to build in benches for pilgrims and travellers to rest so there are nice cement benches sticking out of old buildings all around Florence except not at the train station where they really need them. There were also places on the outside of the homes for people to tie up their horses, kind of providing parking so that people could come into their courtyard and do business. Gelato and sherbet were invented when a rich Medici was preparing a wedding feast and put up a competition for somebody to invent a dish and so a bright Italian went up to the mountains and brought back snow and froze milk, added egg yolks, sugar, etc and came up with gelato. And they call Bologna the Culinary Capital of Italy. So this morning we trundled off to see the Duomo. This is one of the largest churches in the world, has a huge dome and is made of marble which is a common building material around here, marble walks, stairs, floors, etc. We told the guards that we were going in to pray, so we did not have to buy a ticket. Some of the stained glass is by Donatello and we had a little prayer and admired the wonderful painting on the ceilings as well. We had pizza for the first time for lunch and it was thin crust which I recommend. So now we have to pack up our backpacks and walk over to the train station, our train leaves at two fourteen and gets into Rome at 345 and I have our hostel, guest house type thing, booked, Cristina's Residence. It is walking distance from the central terminal. The train was nice we had seats by the window, very comfortable and wifi. The scenery was amazing but most of the time we were in a tunnel so if you want to see the country side go by bus. We actually have a map of Rome so that is a first and we have pretty good directions to the hotel so we find it within twenty minutes of walking. The guy who lets us in says "there has been a mix up but we have prepared a small room and we will move you to a larger one tomorrow". Well it is small with a bunk bed but it has a private bath and it is bigger than a train compartment and smaller than the cabin we had on the Viking Ship from Stockholm to Turku Finland which remains in my mind one of the biggest all time bargains, fifty dollars each with a private room and private bath from Stockholm to Turku, Finland, all night sailing. Great deal. Anyway our room is clean it has what we need and we get BBC on the TV and wifi actually works in the room. There is a nice courtyard outside of the hotel and we are on a quiet street near the university. May I mention 130 dollars Canadian for three nights including breakfast and taxes. Not bad for a world class city like Rome. I am excited as I have arranged an audience with the Pope on Wednesday we have to pick up our tickets Tuesday night. We will have an audience along with six thousand other people but hey, I will only pass this way once and the pope is a very famous guy. Tonight we are just relaxing, will go out for pasta later and will watch the news on BBC we don't know too much what is happening in the world so it is nice to catch up and then tomorrow we will have a full day of sight seeing. I expect to be pretty busy over the next few days and hope I see all the important sites. We will tour the Vatican Museum Wednesday since we are there anyway seeing the pope. It seems a bit warmer here, soft air, we are near water. We are near sea level. We like it here.